Karla Campos, Entrepreneur Moms Rock! 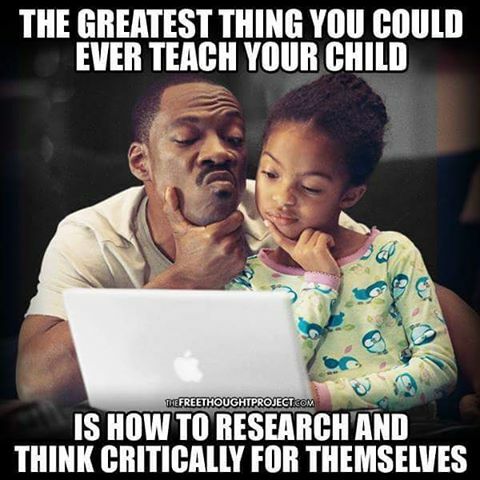 Teach kids to research and think critically. There was a conversation today on the social media page of a local newspaper. I would classify the comments on the post as “The usual judgemental commentary.” Karla isn’t that being judgemental? Yes it is. When I was young I was taught to think critically and outside myself. My final judgement after critical thinking is always based on the good of the whole. It’s never just based on my position alone. We all judge, it’s human nature. If we think critically however, we can focus on the intent of the judgement. We can see the intent of others and their judgement. We can focus on solutions rather than problems. Intent is only one part of the equation. How many people’s well intended wrong information has caused more problems than necessary? Critical thinking is important because what is visible is not always the actual situation. We need to teach kids to ask how and why, instead of just repeating facts. We need to teach kids that they won’t always get an immediate reward (example a compliment) and that is fine. A compliment doesn’t affect their importance. It’s more of a sticker for a job well done. From life experience you will learn that people’s personal opinion influences what they compliment. Maybe someone really likes red and even though you painted an amazing blue mural, they don’t like blue. You wouldn’t know that with out exploring the why, critical thinking. What’s your take on critical thinking? Do you have any proven methods you currently use? Karla Campos is a famous Latina entrepreneur mom, influencer, and author. She is a technical founder with a passion for education, community, and making the world a better place. Karla has been featured on several media outlets for her work with moms, entrepreneurship, and education. Karla founded the Entrepreneur Moms Club with the mission of helping moms through the journey of entrepreneurship.